Collaborations is an incredible collection of classical Indian music from Ravi Shankar and friends. These discs (three CDs plus DVD) exemplify the spiritual and ageless songs that influenced George Harrison’s music. Pandit Ravi Shankar is a learned scholar of Indian music and a master of the sitar. The celebration of his 90th birthday in 2010 warranted a special gift for his fans, the box set, Collaborations with includes Shankar’s own compositions and recordings with involvement from George Harrison of The Beatles. The set includes three audio discs (two of which had never been released on this format before), a concert recording on DVD, and a book in some carefully considered packaging, which makes this set worthy of a man of such esteemed stature. 1997’s Chants of India (formerly out of print) is the first disc in this deluxe package. Ravi Shankar created this music to frame ancient Sanskrit chants with George Harrison producing it. The solemn “Vandanaa Trayee” sets the tone for the first part of the disc. It is a trio of salutations for the god Ganesha, goddess Saraswati and the Guru (teacher) featuring an evocative sitar line in its midst. Shankar composes his music respectfully around prayers like “Asato Maa”, “Poornamadah” and “Gaayatri” engaging each one by taking a somber and sentimental approach. The latter half of the disc is no less fervent or didactic, athough Shankar’s instrumentation is more forthright. “Svara Mantra” is the sole entirely instrumental song; its vibrant strings and flute convey the vibrancy of India. “Prabhujee” may be the most soul nourishing with an incantation about seeking the Lord and welcoming him into one’s life and filling one’s heart with love. Classical Indian music is represented by a long out of print recording, produced by Harrison, entitled Ravi Shankar’s Music Festival from India. Unlike the first disc, with its ceremonial constraints, the second disc is more varied, lively and instrument focused. “Bhajan” is a joyful chant to Krishna, Gopal and Govind, while “Naderdani” has Shankar’s sitar evoking playfulness with masterful precision. “Dehati” is a percussion showcase as the tabla players create two minutes of call and response near the end. Unlike the DVD presentation of the same name, this disc is from studio sessions in 1976. 1974’s Shankar Family & Friends also sees first light on the third compact disc and includes the Dream, Nightmare and Dawn ballet Shankar composed but never staged. Talented Indian musicians get by with a little help from Westerners like Ringo Starr, Klaus Voorman, Billy Preston and Harrison himself. Just a moment of listening to the song, “I am Missing You”, with its piano and saxophone intro plus English lyrics, reveal this collaboration. This is one song I would avoid, though it’s “Reprise” smoothes over the outlandishness. The ballet’s “Overture” demonstrates the musical diversity the project encompasses. “Lust” is a light calypso-ish song with marimba and woodwinds. Shankar’s rapid sitar is the focus of the eastern melody of “Love-Dance Ecstacy”. “Dispute & Violence” starts with vocal call and response interaction then transforms into an upbeat dance number. Everything ends optimistically though as the ballet progresses from an “Awakening” to “Peace & Hope”, a slow building and collaborative, yet anti-climatic, finale. The DVD contains Shankar’s Music Festival from India performed at Royal Albert Hall on September 23rd, 1974. It will not suit consumers of high def footage but those will not be impressed but like Harrison’s own Concert for Bangladesh, this recording is effective through close-ups of Shankar and friends as it shifts between the musicians. After he is introduced and embraced by Harrison, Shankar alternates between conducting and performing against a saffron backdrop shown depicting “Om”. Engaged in the latter, Shankar immerses himself in a trance and works up sweat while his fingers dance upon the strings of his beautifully inlaid sitar. Unfortunately much of the video footage from the concert was lost but the audio has survived. It is presented in full on the disc as a separate feature. The sole “bonus feature” included is a clip of a wizened Shankar involved in remastering the concert with his daughter, Anoushka Shankar, where the Pandit relives the performance. Finally there is a hardcover book included which shares dialogue from Harrison and Shankar concerning their musically intimate relationship alongside unreleased photographs. Some quotes worth sharing will further emphasize the historical importance of this music. 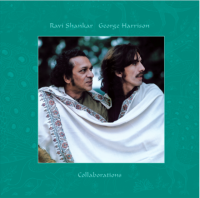 “Ravi Shankar is probably the person who has influenced my life the most” says Harrison in the liner notes. And though Shankar was not aware of The Beatles when the two first started their relationship, he comes to realize that Harrison “has a wonderful soul". Harrison, acknowledging adoption of the facial hair of the time, says “moustaches were part of the synchronicity and the collective consciousness”. The diligence of Harrison brought Ravi Shankar, Indian music and Eastern spirituality soundly into Western collective consciousness. Some interpretation and translation of Sanskrit and Hindi provided by reviewer’s mother, Shama Mital.